In his weekly San Francisco Chronicle column, however, Brown referred to it as the "elephant in the room" and acknowledged that he used his position to help her career. "I’ve been peppered with calls from the national media about my ‘relationship' with Kamala Harris, most of which I have not returned," Brown wrote. "Yes, we dated." Brown goes on to address the fact that he appointed Harris, who was just a few years out of law school and working at the Alameda County district attorney's office, to two well-paid posts on California state commissions and later helped her in her first election. "Yes, I may have influenced her career by appointing her to two state commissions when I was Assembly speaker," he writes. "And I certainly helped with her first race for district attorney in San Francisco." The two reportedly broke up in December 1995 just before he became mayor, but he remained a political ally. 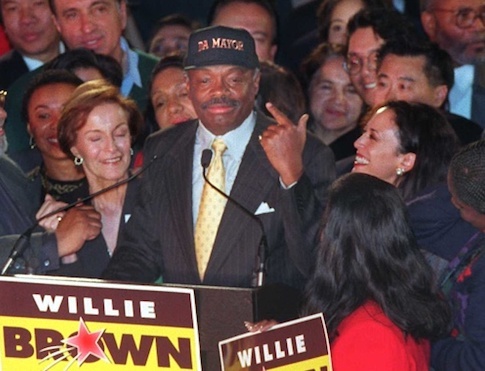 Brown is credited for connecting Harris with the donors who boosted her successful 2004 campaign for San Francisco district attorney, during which she outraised her incumbent opponent. The Los Angeles Times reported this week that Brown's "stamp of approval was crucial in raising money from the San Francisco establishment." Brown attempts to belittle his help for Harris, noting that he also "helped the careers of House Speaker Nancy Pelosi, Gov. Gavin Newsom, and Sen. Dianne Feinstein." He was never involved romantically with any of these three. The two positions Brown appointed Harris to—on the Unemployment Insurance Appeals Board and the California Medical Assistance Commission—paid handsomely. SF Weekly reported back in 2003 that the two positions earned her more than $400,000 over five years. Harris defended her decision to take the posts Brown got for her in her 2003 interview with SF Weekly despite her lack of experience. "Whether you agree or disagree with the system, I did the work," she said. "I brought a level of life knowledge and common sense to the jobs." Brown also reportedly gifted Harris with a BMW in 1994. He is 31 years older than Harris. Brown remains a supporter of Harris, but wrote in his column that he is concerned the buzz around her campaign launch may not translate into actual support from voters. "California Sen. Kamala Harris is riding a buzz wave the likes of which we haven’t seen in years," he wrote. "The question is whether she can turn the buzz into a solid political operation." He said her first big test will be whether she can fill the streets during her campaign launch event on Sunday in Oakland's Frank Ogawa Plaza like former President Barack Obama did during his first campaign in 2007. "That feat took months of old-fashioned organizing by Obama’s operation," he wrote. "It will be interesting to see if Harris can match it using social media."